I don’t usually read mysteries. I’m more into sci fi/fantasy. But, I am willing to go outside of my usual tastes when something interesting catches my attention. That’s how I ended up with The Missing Ink, and its sequels, on my bookshelf. The Missing Ink is the first book in the Tattoo Shop Mysteries, by Karen E. Olson. There are four books in total in the series, and yes, I’ve read them all. What drew me to these books? Well, the main character is a woman, Brett Kavanaugh, the owner of a tattoo shop in Las Vegas. That was pretty much all it took. Strong, independent female lead, owns her own business, which just happens to be a tattoo parlor. I was cautiously hooked. As I said, I don’t usually go for mysteries, so that was a bit of a stretch for me. And I was also concerned that some annoying romance factor would be awkwardly shoehorned into the books, just because ‘that’s what women like to read about’. Well, no, not me. But, it looked like a quick read, so I decided to try it out anyway. And, I liked it! I’ve seen this series described as ‘cozy mystery’ – since I’m not a regular mystery reader, I wasn’t exactly sure what that should mean. But, it was definitely fun and fast paced – yes, a real ‘page-turner’ as they say. The Las Vegas setting was well developed and the intricate plot really drew me in. And although there was a hint of ‘romance’, it wasn’t Brett’s main concern in life, it was actually portrayed much more realistically, in my opinion. As an aside, not something that she becomes stupidly obsessed with. Because you know, there are murders happening, and that’s what the story is really about. At the end of this book, I definitely wanted more. Unfortunately, I read The Missing Ink soon after it was first published in 2009, so I had to wait impatiently for the sequels. 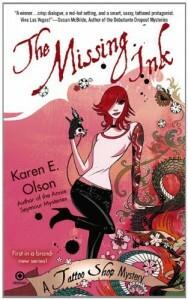 But the series is complete now – as far as I can tell, Olson isn’t planning on writing any more Tattoo Shop Mysteries. So, you’re in luck – you can read the entire series all at once! ← Throwback Thursday: College View Carnegie Library.